Every member of our team has completed a rigorous training programme and been vetted to insure that they are trustworthy individuals. We would not send anybody to your home or business premises that we did not trust completely as we value your custom and want to make sure that you are comfortable with any arrangements made with us. We offer one-off services such as a post construction or spring clean, as well as supply home and office cleaners for regular domestic and commercial contracts in Central and Greater London. Our experience of dealing with commercial clients of all sizes and individuals with widely varying requirements means that we are confident we can meet your needs, whatever they may be. We supply operatives that work in hospitals, bars, cafés, restaurants and public areas in the capital, as well as numerous residential properties and other commercial premises. We believe that it is important to build close relationships with our clients and we strive to ensure that your requirements are satisfied at all times. There are many companies operating in the South East that offer some of the services we provide but we honestly believe that we are your best choice. Whether you are a company proprietor looking for professional cleaning services London or a homeowner who does not have the time or the energy to face housework after a hard day at the office, our fully insured operatives are here to help. We strive to build lasting relationships with our clients, based on mutual respect and openness. Through extensive experience, we have created a highly efficient and reliable service that far exceeds the rest. 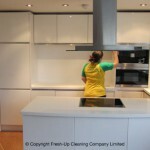 Fresh-Up is the number 1 domestic cleaning service in London.